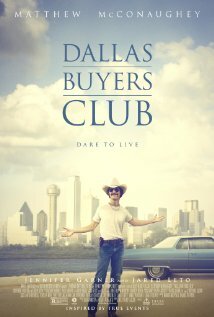 Dallas Buyers Club is set the 1980s and is based on a true story. Hard-living Texas rodeo cowboy Ron Woodruff (played by Matthew McConaughey) finds himself very sick. When he is found to have AIDS as a result of his sexual promiscuity, he is given thirty days to live. He hears about a new drug called AZT that has been proven effective in tests with laboratory animals, but the problem with AZT is that it hasn’t been approved for use by humans. By the time it goes through all the government channels and is finally approved, it will be too late to help Ron and thousands of other AIDS patients who might benefit from it. Ron bribes a hospital employee to provide him with AZT, but after he has taken it for a while he finds it doesn’t do him any good. From that point on, Ron is more resourceful than we might have given him credit for. He refuses to give up and die in a few weeks. He researches his disease (this is before the Internet) and discovers just what his limited options are. He travels to Mexico, where he might buy certain drugs that are not available in the U.S., and befriends an American doctor there who is willing to help him. He travels to Japan, Canada, Israel, and other countries, where he buys large quantities of the drugs, proteins, and vitamins that might help him and others. He is, of course, operating outside the law. He establishes what becomes known as the Dallas Buyers Club. Instead of selling drugs to AID patients, he sells memberships that allow patients to draw from his stock of drugs whatever they need. The government is there to thwart him at every turn. If they can’t shut down his operation, they will get him for income tax evasion or any other trumped-up charge they can think of. Other standout characters in Dallas Buyers Club include Raymond/Rayon (played by Jared Leto), a transsexual who dresses and acts like a woman (though still a man), with AIDS contracted through intravenous drug use. Ron is at first repelled by Rayon’s feminine behavior, but eventually they become friends and business partners of a sort. Eve Saks (played by Jennifer Garner) is a compassionate doctor who helps Ron and in doing so places her job and her standing in the medical community in jeopardy. Dallas Buyers Club is grim, as stories about sick people who cannot get well always are, but it is a story that demonstrates the value of perseverance and of someone who is willing to operate outside the system. Whether Ron Woodruff is right or wrong in bucking the system, he is able to extend his own life, and the lives of others, far beyond what would have been possible through conventional methods.